Most people of heard of the Mitford sisters, however, most people are unaware that the Mitford family originate from the village of Mitford in Northumberland dating back to before the Norman conquest. The family have played a role in British and global history. The book traces the family history back to 1042. Hugh Mitford Raymond is the last member of the Mitford family along the 'true' blood line. Born in South Africa, now lives in Nice, France. He has had an interesting and varied life. Now and again a book comes along that hits just the right note and you can’t put it down. “The Mitford Family, Nearly a Thousand Years of History” is a fascinating insight into one of history’s most famous and controversial families. Hugh Mitford Raymond details the power and the glory of his aristocratic antecedents from Norman times to the disintegration of the family seat in the 21st century. Landowners and philanthropists, writers and historians, activists and fascists, as well as peers of the realm, form part of an extraordinary amount of historical detail in the book. There are families. Then there are dynasties. The Mitfords belonged to the latter. Not to be missed. A reference for historians... but not only. You read it like a novel. Why did nobody write this book before? Apart from being a fascinating read, this is a very well researched book about one of Britain's most famous families. Not to be missed. 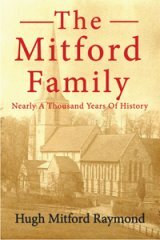 The Mitford Family well deserves to win the Autumn 2016 Prize. An enjoyable and very valuable piece of East Yorkshire history through the ages. Well done! This book is evidently well researched and provides a fascinating look at a most distinguished and ancient family. Following over a thousand years of Mitford history must have been quite a challenge for the author. The fact that he is a Mitford himself adds an extra dimension and passion to the telling of his family's story. I would highly recommend this book to anyone interested in history or intrigued by the idea of putting those Mitford girls into context! An excellent and well researched historical record covering one of England's oldest families.